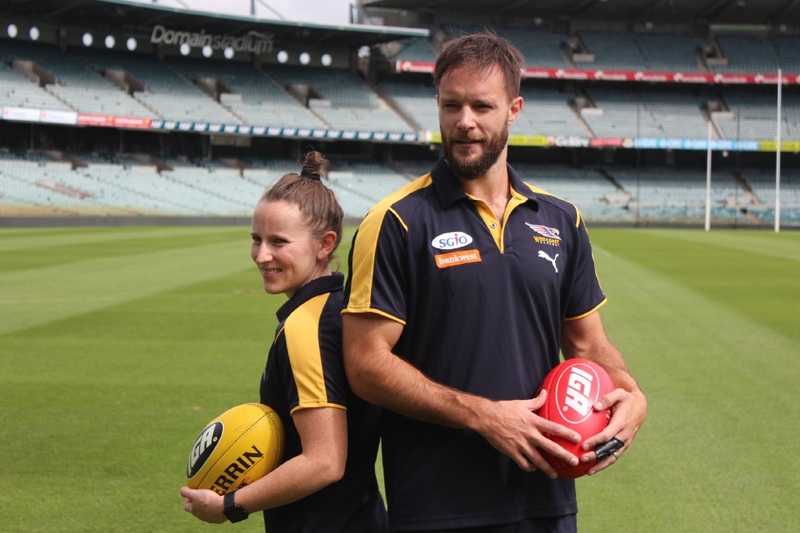 West Coast’s women’s captain Kara Donnellan with injured defender Mitch Brown prior to Saturday’s derby games. THE West Coast Eagles are preparing to be one of the clubs involved in the National Women’s League next year. Like a number of AFL clubs, West Coast is looking to procure one of up to eight inaugural licenses in the start-up phase, recognising that the league will develop and grow over time. Female football has undergone significant growth for the AFL during the past five years, with participation in programs and competitions increasing from 95,000 in 2011 to 318,000 in 2015. Those numbers are reflected locally. On Saturday, when a women’s derby is played as a curtain raiser to the Eagles’ Western Derby clash with cross-town rivals Fremantle, it will be broadcast on Foxtel. As part of the lead-up to the game, West Coast Eagles coach Martine Pearman and captain Kara Donnellan were introduced to club staff and held a pre-game media conference, where they handled the spotlight with eloquence and aplomb. A clear love for the game is evident as they spruiked the virtues of the women’s game. Pearman is an accomplished coach, leading the Coastal Titans to four consecutive grand finals and two premierships in the local competition. She has also been an assistant coach at Melbourne for the highly successful exhibition matches against the Western Bulldogs in recent years. The spotlight those games have cast on the rapidly-growing women’s football movement have been the genesis of this looming national competition. Donnellan has an unbridled passion for the game she has played since she was nine. She is also involved in the game full time as part of the V-Swans community program run through Swan Districts Football Club. The West Coast Eagles is committed to diversity and gender equity, and the vision is to field a sustainable, professional and premiership-winning women’s team that grows new market opportunities and helps grow female football in WA. n Community Newspaper Group is an affiliated partner of the West Coast Eagles.